Rubber. Black rings that, all things being well, keep your vehicle in friction minded contact with the road, trail or whatever entertaining trouble you have driven yourself into. The focus of tires on overland has seemingly increased in recent years. Owners keen to express their love of the ones that they own, their loyalty immediately swayed when they purchase something else. Everyone feels that their tires are the right ones and we didn’t own Yokohama tires. All Terrain are currently the hot ticket for most, the mix of on-road manners and off-road intermediacy offering a combination that is seemingly built for the long haul. Americans, in particular, have blurred the line between off-road and overland. Trail difficulty being the benchmark from which they separate weekend campers from their ranks. What is an overlander? A discussion for another campfire. But for those with a separate off-road vehicle or a vested interest in the gnarly stuff, a set of Mud Terrain is a more obvious choice, asphalt be damned. We first touch base with Yokohama through Basil Lynch, the blonde, photography obsessed, surfer dude from New York and now San Diego. 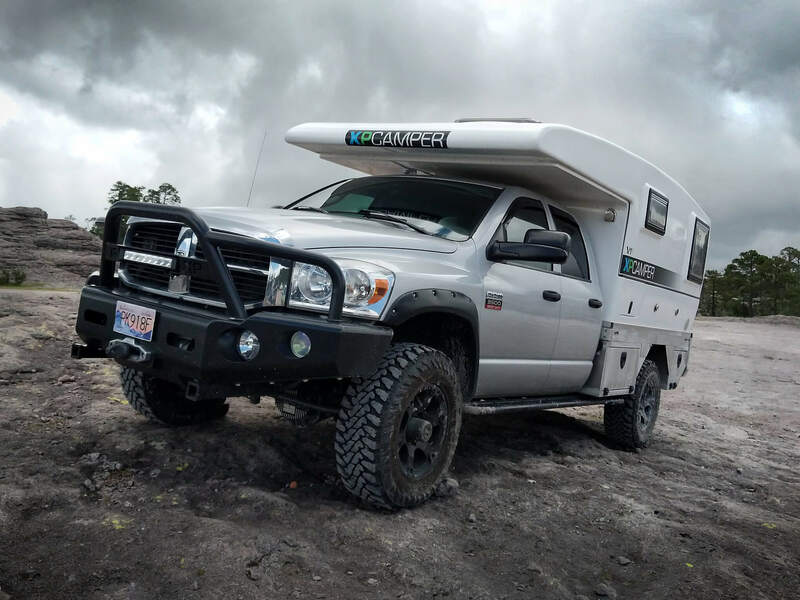 We had spent some time off road in Utah and Arizona with Basil, his Instagram celebrity Ford F250 and custom camper Bruce (@basillynch) and Rob Rossi, a photographer from LA driving a newer Ram 3500 with 4Wheel Camper (@robertrossi1). Rob and Basil were front and centre on the Yokohama stand at Overland Expo West. They mentioned This Big Road Trip?s travel plans to Paul Algarin, Yokohama?s Product Marketing Specialist and feet on the ground at the expo. Paul, in turn, mentions Yoko?s new rubber to us. Yokohama had released a new set of mud terrain hoops and Paul was eager to get them onto some trucks with an interesting travel schedule. Yokohama Geolandar M/T 003. Mud Terrain? I was unconvinced, aside from the aesthetic, with its beefy tread spilling onto the tire sidewall. All Terrain, on paper, is a much better fit for our style of travel. Mud terrain also comes with a caveat to the great looks and off-road ability, road noise for one. Rumbles and whine are common in mud terrain reviews. Then there was the wet weather issue. Chunky tread is great in the mud, each revolution shedding the sticky stuff and leaving the blocks ready for action once they hit the ground again, but they are traditionally poor in the rain. Paul insisted that these adverse traits had been addressed in their latest release. It could be marketing hype, could be a new breed, only the road would let us know. We already had some very good Toyo A/T. A tire that had performed everything we had asked of it. But curiosity prevailed. We had the tires delivered to the wonderful Nina at Barlow Adventures in Sedona; getting them installed at an unimpressive tire centre on the main drag. Rubbered up, we hit an easy BLM trail to our camp spot. A route we had driven 8 times, in and out, over the previous four days. Certainly nothing of note, just some washboard sections, and a few bumps. But the difference with the new Yokohama?s was stark; the tires felt more pliable and forgiving despite our laziness in not airing down, the trail just short enough to make airing back up an unlikely chore. Doubting the already established talents of the installers I checked the tire pressure. They were on the nose at 80psi, the drive and associated heat likely bumping them up from 75psi. The pressure was correct, the ride just smoother, sure-footed. The pressure check revealed more about the lug nuts, some of which were loose to the point of falling out with just one anticlockwise twist. The installers attention to detail dealing a hand full of jokers and going all in on safety risk. 10,000kms later and the Yoko?s have seen their fill of driving conditions, although, ironically, not much in the way of mud. Dusty and rocky trails were evident in New Mexico. 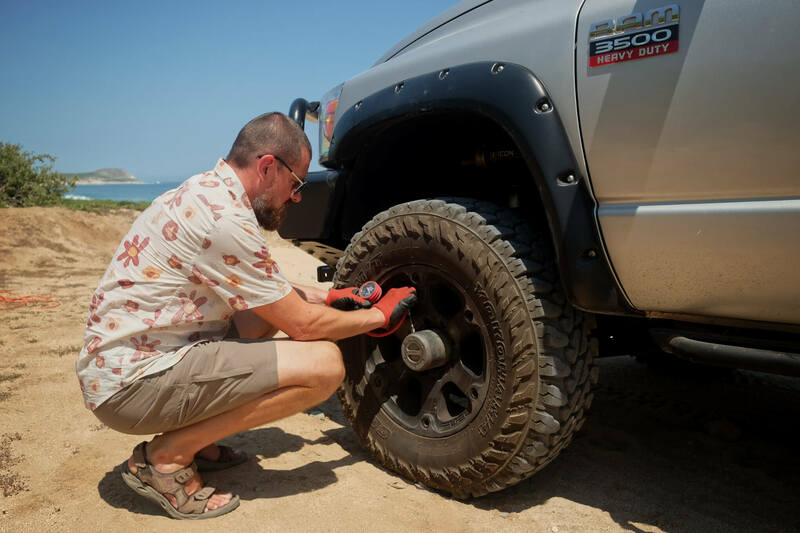 Baja added beaches and scorched asphalt; the maintenance of which requires next level hand-eye coordination to avoid the gaping abysses that are mistakenly referred to as potholes. Sharp twists of the wheel and heavy braking testing the tire?s grip. Mexico also adds occasional well-hidden topes (speed bumps) providing some added excitement that no-one requested or required. All these tests breed confidence in the Geolandar M/T 003 attributes being correctly espoused by the marketing hype. Tropical rainstorms in Sinoloa, Mexico saw us dodging downed trees on major three lane carreterra?s, cutting through an inch or so of standing water; a further half inch on our windshield blurring our vision despite the wipers on ?rapido? ; the tires never missing a beat or longing for a slide. Another box ticked for the supposed improvements this new tire promised on a subject a Mud Terrain tire usually has no place to hang its flag. M/T?s and rain are not usually so amicable. It is a mud terrain tire, and as such it simply cannot nail a perfect score across our previous Toyo All Terrain, which is not even it’s direct competition. The All Terrain is very likely to have more grip on asphalt and in the wet. The new Yoko M/T has a redesigned block with special siping help expel water and add more rubber surface to the ground, vastly improving rain performance. I doubt we drove either model near it’s limit but in our real-world conditions we drove there was no discernible difference between the two, despite calling on both to quickly perform on occasion. In an overlanding version of ?Off Road? the M/T was noticeably better and the grip on anything loose way a distinct jump above the A/T. On road the traditional whining attributed to the blocky M/T profile is non-existent with the Geolander. It prefers to sing a tune at very low speed on grippier or smoother surfaces, the tread rumbles gently as each block touches down. A rarely heard gruff noise far preferable to consistent road whine, which blighted our Toyo A/T once the needle nudged 95kmh. Elsewhere on asphalt are more signs the gap between the M/T and A/T?s has been crossed. The Geonlander?s lane manners are ?on leash? without the wandering usually experienced as tire tread gets more aggressive. Aggressive. A word that usually summons negative thoughts, but not to an overlander keen for a certain aesthetic. These tires look great, collecting murmurs and glances from the trail savvy to the girl next door. The super chunky tread is stretched nicely onto the outer sidewall. It looks mean and provides protection from admiring rocks at the trail edge. The Yokohama Geolandar M/T 003 may not be the best choice for a more road oriented overlander. But the good mileage, road manners,?and off-road capability, do more than enough to reel in the differences to an A/T. When you see how they look, you might feel the slight compromise is adamantly worth it. A case of the head being satisfied enough that the heart is allowed free rein. More regular visits off-road gift the advantage to the Yokohama Geolandar M/T, no question. It seems to have bridged the on-road gap to an A/T whilst maintaining a great performance off-road. My initial doubts have been firmly cast aside and unless Yokohama has anything else up their sleeve my next set of tires will be a direct replacement with these. During the planning of our trip, we have been fortunate to meet people who have shown a great deal of enthusiasm about the expedition and have supported us through products/services or gone out of their way to help in some way. They played a part in helping make This Big Road Trip a reality, are passionate about what they do and passionate about doing it well. If you're in the market for their product or services then we can highly recommend them.